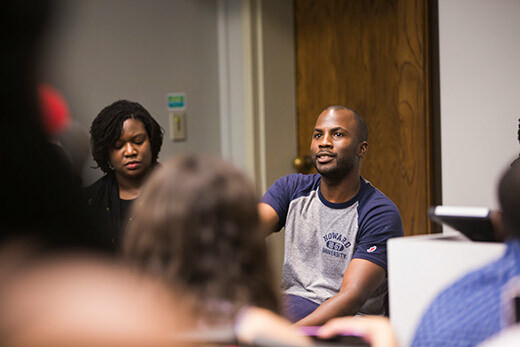 An Emory University program that expands access for underrepresented minorities to earn doctorates and faculty positions has received renewed funding from The Andrew W. Mellon Foundation. Emory’s Mellon Mays Undergraduate Fellowship (MMUF) program will receive $131,000 for the current year. Emory selects its own fellows, rising juniors in Emory College of Arts and Sciences, with demonstrated academic excellence and serious intent to pursue a doctoral degree in selected humanities and social sciences. “As we prepare our diverse student body to contribute as scholars and thought leaders in the academy and beyond, we are committed to sustaining an environment at Emory that promotes full participation and inclusivity. The MMUF program provides an ideal platform to advance this objective and to support our students as they pursue their education and development as thought leaders with diverse intellectual interests and perspectives,” says Dwight A. McBride, provost and executive vice president for academic affairs. The latest grant will pay stipends and research support to 10 junior and senior fellows during the academic year. The Mellon Foundation also provides funding to encourage the kind of social capital – mentoring, grant writing, conference presentations, how to publish workshops – that often makes the critical difference in graduate school and faculty success. Since it was established in 1988, MMUF has produced 762 PhD graduates. Emory, which joined the program in 2000-2001, has produced seven thus far, many of who are now in tenure-track positions, along with several former students who are currently in prestigious graduate programs pursuing doctorates. Bringing more underrepresented students into the pipeline for doctorates has a profound impact on knowledge production, the retention of a diverse student body, and the intellectual strength that diversity brings to academic communities, Anderson says. “This is why we do this work. Because of the initial leadership of the late professor Rudolph Byrd and then professor Dianne Stewart, the MMUF program at Emory is, without question, first-rate,” Anderson says. “Our fellows are completing their doctorates at Harvard, Northwestern, Michigan, Brown, Rutgers and more. They are the recipients of major fellowships, including the Fulbright." Fellows in the four-week immersion institute attend lectures on topics such as research, work-life balance and the art and philosophy of teaching, as well as engage in weekly writing exercises to hone their critical thinking and analysis abilities. They also create a prospectus that forms the foundation for a two-year research project with faculty mentors. The summer program prepares fellows for the MMUF, which in addition to stipends provides each cohort with ongoing mentoring, research support and professional guidance from faculty, coordinators and graduate students. Fellows enrolled in PhD programs up to 39 months after earning a bachelor’s degree are also eligible for up to $10,000 in loan forgiveness.